This is a legal mystery. That does not infer any others are illegal, just that this mystery is centered around a personal injury attorney. Tug Wyler appears to be respected by everyone but his secretary. He finds himself with a client that mystifies him. I found the book occasionally tedious with some things over explained and other that didn’t need explained. 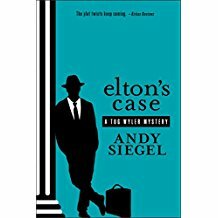 Elton, the client, was mysterious. His law suit against the city was the basis of the plot. The author did an excellent job in presenting Tug’s torn sentiments regarding the client. The book is one of a series and all seem to be differing legal cases. I have mixed feelings on the book. It held my interest but did not captivate me.